Do you know Al Vulo? Not? Then its time. For a limited time only your chance to pick up three wonderful skins by Al Vulo for free and one for just 50 L$. Where to find them? Continue reading as not all are available at the store. Always a good adress for hip and stylish Second Life fashion is “R.icielli” (also written “Ricielli” in search). Great fashion with incredble texture ans working with scultped prims to make it more realistic. Do you know “The Dressing Room” or “The Dressing Room Blue”? If not, it’s time. TDR and TDRB are great options for you to go shopping. Several great designers offering their fashion at discount prices! Felicity Group Gifts – Free Quality Shoes! No need to wander around Second Life barefoot. Ever asked yourself where to get great SL Fashion at decent prices? 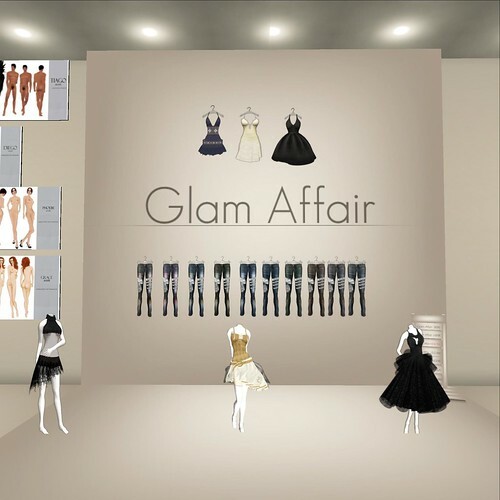 Glam Affair seems not to be the first name that comes to mind because their exclusive designs usually also have exclusive prices, BUT Glam Affair has a huge Outlet store with tons of stuff for just 10 Linden each. Ladies, you need to move fast, if you want to get these skins. Rockberry participated in two hunts at the end of last year and though the hunts are over the hunt gifts are still out – but for how much longer? TP by Rockberry and make sure you get them before they are gone. Ladies, the Vanity Skin Fair has started and it’s running til March 6th. Make sure you get a chance to run by and take a look around. Be warned though: The region is ususally full and lags like mad. So, be patient and take off everything (e.g. AOs, Hair and other attachments) you dont need. They won’t rez anyway and you’ll be grey to everyone else anyhow – so why bother adding to the lag?